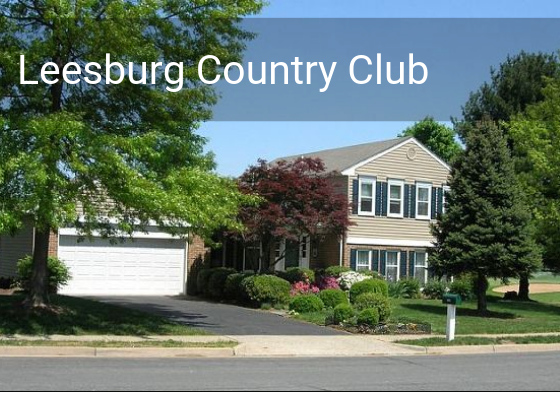 Located on Route 15 South in Leesburg, Virginia, the Leesburg Country Club neighborhood was established in the late 1960′s and continued to grow over the course of four decades. Homes border what was originally the Leesburg Country Club golf course, but is now Westpark Golf Club. The first homes were constructed just after the Ed Ault designed course opened in 1968. As more homes were added, a variety of architectural styles were built: ramblers and raised ramblers, then split levels and split foyers, dutch colonials and colonials. The streets are wide, with sidewalks allowing for long walks, and many homes have inviting front porches. The homes at the beginning of the development were built first, and as the neighborhood winds up and back into the hillside, the last homes were finished as late as the early 1990′s. Many have stunning views of the golf course, and the mature trees throughout the neighborhood and on the surrounding hillside provide a lovely show of spring blooms and fall foliage. While there is no neighborhood homeowners association governing the area, the close knit community is still maintained beautifully, with neighbors pitching in to spruce up common areas, hold community yard sales, and interact as a community. The golf course, along with the clubhouse building and surrounding land, was placed for sale in 2018. As of spring 2019, a potential purchaser was still in negotiations with the town of Leesburg over their plans for rezoning and possibly gifting some of the unusable land back to the town.